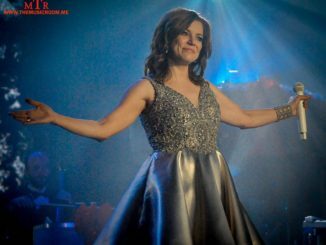 Martina McBride has been making wonderful music for almost three decades now. Her voice is one of the strongest, not just in country music, but in all of music. Shas has made countless hit records, won numerous awards, and played on some of the biggest stages in the world. Despite that success, she has remained just as down to earth and humble as she was when she signed her first record contract in 1991. 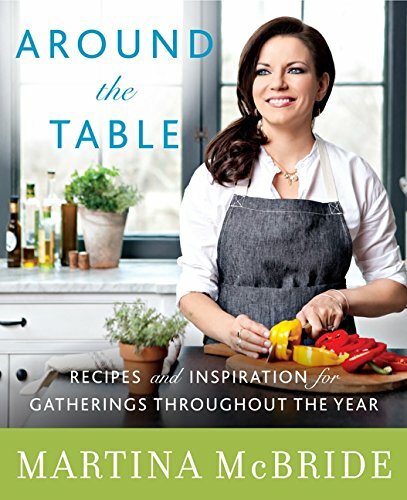 In addition to being a singer, Martina is also a loving wife and mother, philanthropist, and author. 2018 promises to be a busy year for McBride as she is preparing her second cookbook, a new Christmas album, and is still paying sold out shows. I had the pure honor of getting to speak to Martina about all of these things and more. So, turn on some Martina McBride music and enjoy!!! The Music Room: Hello Martina! I want to thank you for taking time out to talk to us today. Martina McBride: Sure, my pleasure. TMR: I have been a long time fan of your music over the years, and while I do want to talk about that there is another passion close to my heart that I want to discuss with you and that is food! 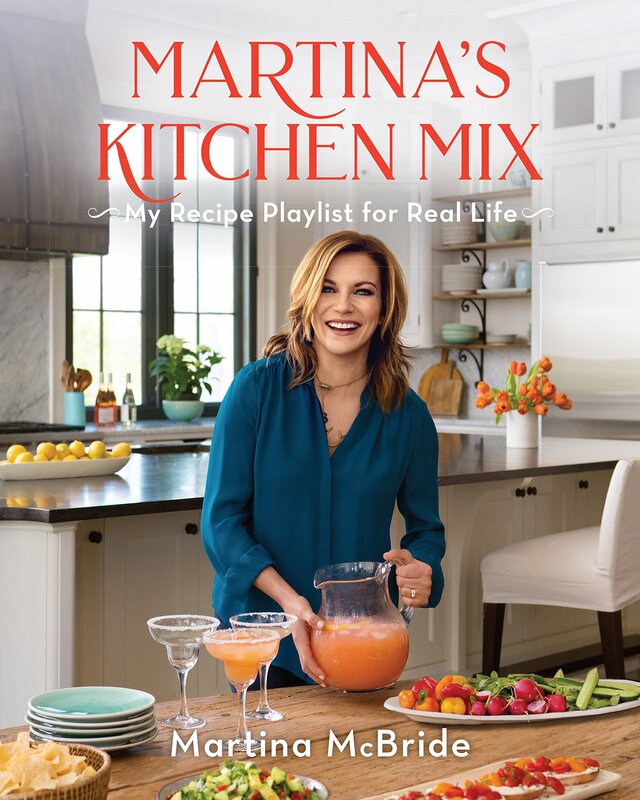 You have a new cookbook coming out this fall called “Martina’s Kitchen Mix: My Recipe Playlist for Real Life.” I’d like to talk to you about that for a few minutes and see what a playlist is when it comes to cooking. MM: It’s a combination of recipes that I use when I’m cooking in my own kitchen. We had a fun play on the music part of it. You know how you share playlists with friends…I’m just sharing recipes with friends. TMR: That’s awesome. What types of recipes can people expect to see in the book? MM: You know, I like balance when it comes to life. I eat pretty healthy 99% of the time, but sometimes a great recipe that has lots of cheese (laughs.) I think it’s a good balance from my first cookbook. It has more vegetarian recipes. It has a few fish recipes and healthier things, but then there’s also things like my mom’s pot roast and things that have been handed down. There are recipes that I cook for my own family. Well, I cooked everything for my family. They had to test everything…but they didn’t complain (laughs.) It’s kind of a mixture. There’s not really a theme to it. It’s not an Italian cookbook, or a Mexican cookbook, or a vegetarian cookbook. I like those kinds of cookbooks if you want to get really specific, but I also love a good old fashion cookbook that runs the gamut of all kinds of recipes that you really want to cook for your friends and family. TMR: Because your first book was geared towards inspirational gatherings, whereas this one is more every day, real life on the go preparation. TMR: So the book is a playlist of recipes…do you have a go-to music playlist for when you cook? MM: We actually put that in the cookbook. I made a playlist of songs I like playing when I am cooking in the kitchen. I like a lot of different things. I like soul and R & B…like Aretha Franklin, Ray Charles, and Motown. It just depends on my mood, like everyone else. TMR: That is cool, I look forward to checking those out. Now, I have to ask. Are these recipes men proof? TMR: Okay, I will try them out and see. TMR: You did your first cookbook back in 2014, and now you have this one coming out. Do you see yourself branching out and doing any other kind of writing? Perhaps an autobiography about your life? You seem like the kind of person has a lot of interest outside of music. MM: Maybe….never say never. I definitely think writing of some kind will be in my future. I love language and thoughts. I don’t know about my life story…but you never know. TMR: Your music has been inspirational to so many people, I could see you doing a line of inspirational books. But I look forward to seeing whatever the future holds for you in this area. TMR: Another topic that I really want to discuss and share with my readers is your charity, Team Music is Love. It’s a long time effort of yours and you have a great campaign going on right now with the Balsam Hill group called “Tis the Other Season to give back.” I know you have explained it on Facebook, but for people who may not be aware of this…would you let people know how they can help just through some simple actions online? MM: For any like, share, and comment on the story that I posted a week or so now, Balsam Hill gives money to my charity. The thing about Team Music is Love that is different is that we’re not just focused on one charity or initiative. We look for where the need is. We’ve helped to relieve hunger. We’ve raised money for a breast cancer research grant. We started a music school in Guatemala for rescued girls. That’s what I love about it. I just love the fact that it has a wide variety of people that it can help. So, we’ll use that money throughout the year to help a lot of people. 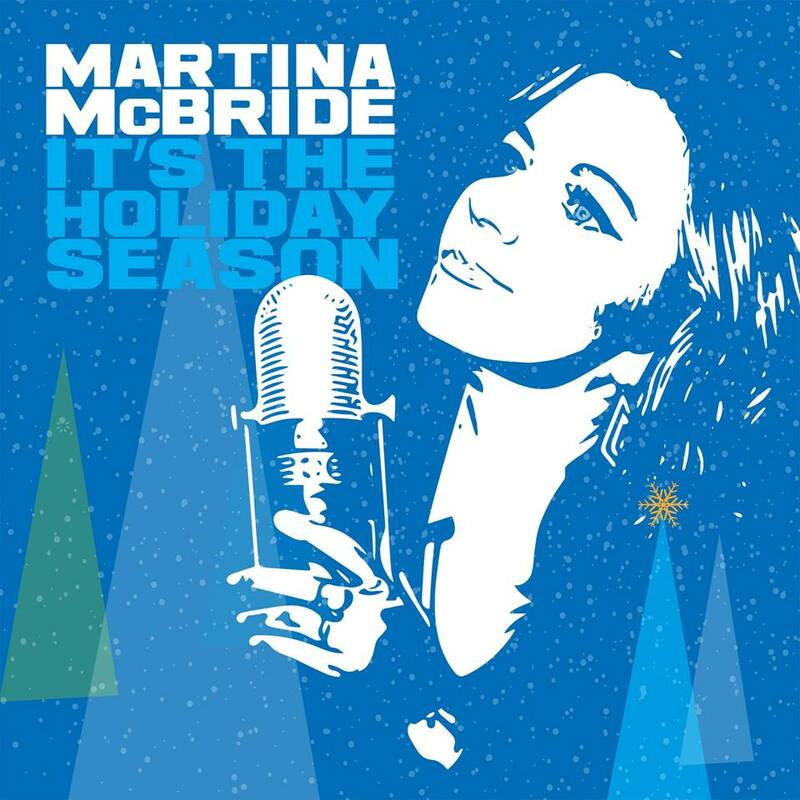 Click on the link above to Martina’s Facebook post and like, comment and share!!! TMR. And people can go to your website…I know there is a link to Team Music is Love to learn more about that and how they can get involved. We’re talking about Christmas in July, but I have also heard some news that you are working on a follow up to the “White Christmas” album. MM: Yeah, we are about finished with it. It’s going to be mixed next week. “White Christmas” was a little more…we had a lot more hymns. Songs like “O’ Holy Night,” “What Child is This?,” and “Silent Night.” This one is a little more on the pop Christmas side. We recorded it with a big band. It’s kind of like the old Ella Fitzgerald, Frank Sinatra, and Dean Martin Christmas records. Like “White Christmas” was very classic, this one is too. It just has a little bit of a different sound and different songs. I’m really excited about it. TMR: Awesome. Did you record that at Blackbird? MM: Actually, we recorded it at Capitol in L.A. I did all of the vocals and backing vocals at Blackbird. The tracks we recorded at Capital in L.A. with this amazing 32 piece band with these people who have played a lot on those old records that I was talking about. I wanted it to be really authentic and a lot of those records were made at Capitol in L.A. We had a great environment and creative vibe and I think it lent a lot to the finished product. TMR: Will that lead to a “Joy of Christmas” tour this year with that release? MM. Yeah, we are doing 8 to possible 10 dates with symphonies. TMR: Wow! We’ve seen it quite a few times, but we really enjoyed it last year when it played in Troy, OH. It’s always a great experience, but I can’t even imagine it with a symphony. I can’t wait to see that. MM: I’m excited. It’s going to be fun! TMR: I bet. You’ve recorded a new record and wrote a new cookbook, but you are still out there playing sold out shows. I have seen nothing but great responses to the current tour. I have to ask, at this point in your career you have such a songbook filled with great music…how do you approach a live show these days and creating a set list? MM: Well, you do a lot of hits. I have been fortunate enough to have a lot of hits and I know that’s what people want to hear and that’s what I still want to sing. We do a few songs from “Reckless,” three I think. Then we do one or two songs from “Timeless.” And we do some covers as well. I kind of put my self in the place of the audience. Obviously, I can’t play every song that we’ve recorded that was a hit. Also, there are a lot of ballads that we can’t…especially at an outdoor festival, we can’t really load up the show with 60% ballads. There are some that I don’t get to do that I’m sorry about. We do a majority of the hits. We do “Independence Day,” “Broken Wing,” “Wild Angels,” “Blessed,” “Valentine”….There’s a lot for people to hear that I think bring back a lot of memories for people. It’s interesting because I look out into the audience and I see generations. I see older people, I see people my…I guess I’m older now, but my age (laughter.) I see young girls in the front row singing every word to every song, and that’s so cool. TMR: I know one of the strange things for me…I remember going to shows when the “Valentine” video played in the background and your girls were just babies, and now you post things on Facebook and they are all grown up. I’m like, they can’t be that old already. MM: Oh yeah, I know. It’s crazy. Me too. I’ve got two in L.A. now. My youngest is thirteen and she’s turning into a young woman…yeah, it’s pretty crazy for me as well. TMR: I’m sure that when you were first getting started you looked up to women like Tammy Wynette and Loretta Lynn. Now there are a lot of artists looking up to you, I’m sure because you set such a great example. Are there any artists out there that have your ear, and that you are a fan of? Or what’s in your cd player right now? MM: I listen to all kinds of music, especially with a 13-year-old. There’s a lot of Ariana Grande in our house. My older daughters have a wide range of music, so they are introducing me to new stuff all of the time. As far as country, I’m really excited about…I mean, I really think Maggie Rose is really talented. She has a great voice and is very much an artist. Of course, I love Brandy Clark. I still think Lee Ann Womack has one of the best voices we’ve ever had in this genre. I’m trying to think of new people…Maggie is the one that comes to mind. We toured together. She is just really solid and a great singer. She has very creative projects. She did a live album…recorded all live in the studio. That is so interesting to me. It’s so gutsy and so cool and it’s so out of the box from what your mainstream making records for radio is. So, yeah…I admire that. TMR: Obviously, your plate is full right now. I would say 2018 is pretty well taken up. When you start to think about your next record, is having Blackbird Studios available to you, and knowing a guy who is pretty good at that kind of stuff with John (McBride)…does it give you more freedom than what you used to have when you first started out as far as recording new music and saying what you want…as opposed to maybe writing for radio? MM: In a way, yeah. Having Blackbird is amazing. In my opinion, it’s the best studio in the world. To have all of that at my fingertips, there are no limits as far as that goes. For me, the industry is changing. The next album…I’m still dreaming it up. Candidly, my days at country radio aren’t present right now, so I do have more freedom I feel like. I also made records that I loved and didn’t necessarily make records for radio. It was always in the back of my mind when I was cutting an album. Obviously, the record company wanted me to have songs that radio would play. You know, I love those songs. “My Baby Loves Me,” I still love singing that song, but it was always in the back of my head. Now, I do feel like I have…without that thought process, yeah, I think it’s going to be a much freer experience. That’s why I’m really taking my time. I don’t have a deadline. I don’t have a record company that’s screaming for an album during a certain cycle. It’s really freeing. I’m excited. It takes a while to disengage from that. I have to really step back and consider what the options are now and how that looks and feels creatively without that kind of structure. I’m really, actually so excited because I don’t know what’s going to happen. I don’t know what I’m going to come up with. I’m thinking in my mind, I want to do a more acoustic sounding record with lots of harmonies. That’s just what’s going around in my brain right now. Just great songs, as always. Yeah…so, it’s exciting. TMR: That sounds great. We’re all excited for it. 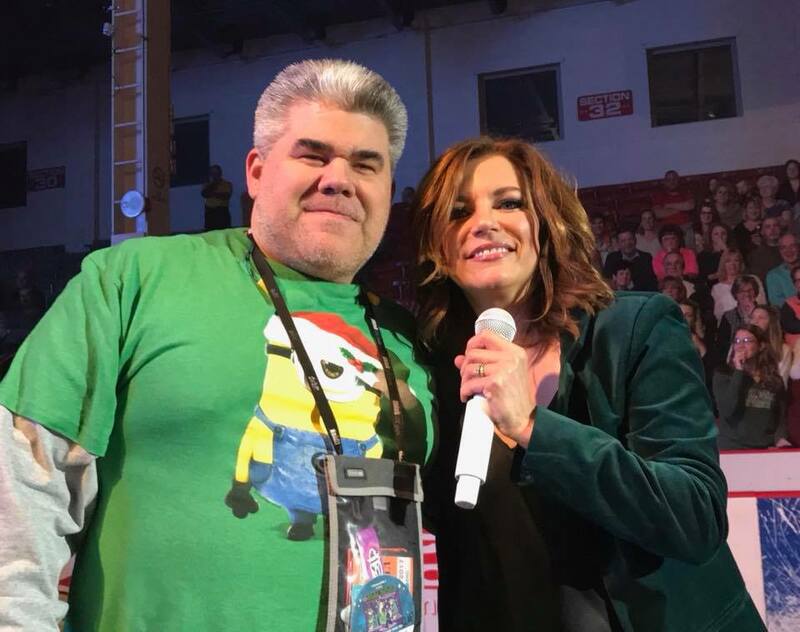 It’s always a great time to be a Martina McBride fan, but especially right now with the book coming out, the new Christmas album, and just thoughts of what the future holds. In Cincinnati, we are really looking forward to your show here on August 25th. Personally, for me, it’s my 12th wedding anniversary that night and “Valentine” was a special part of our wedding, so it’s an extra special treat for us to have you here on our anniversary. MM: Aww, that’s great. Well, happy anniversary a little early. TMR: Thank you, we look forward to seeing you, Martina. It’s been a thrill talking to you. I can’t thank you enough for taking the time out to talk to us. I just wish you the best in all of your endeavors. MM: It was my pleasure, thank you so much.